Quesadillas are a popular dish in traditional Mexican cuisine. A layer of cheese is sandwiched between two tortillas, usually flour, and browned on both sides. In addition to cheese, you can fill a quesadilla with meat, vegetables or seasoning. While preparing a quesadilla is simple enough, tortillas are often burnt or the cheese is not adequately melted. 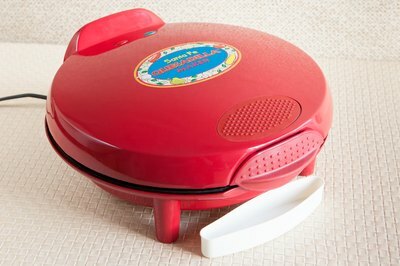 The Santa Fe Quesadilla Maker creates consistent, evenly browned quesadillas quickly. 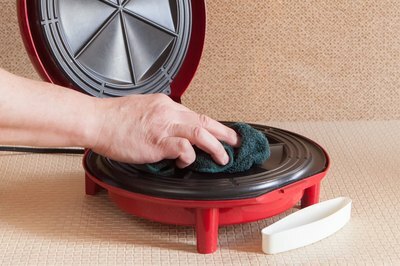 Wipe down the top and bottom cooking plates of your Santa Fe Quesadilla Maker with a damp soft cloth. Dip a basting brush into a small amount of vegetable oil. Open the lid of the unit and brush a light coat of oil onto the top and bottom cooking plates. 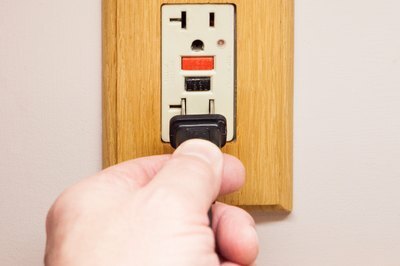 Plug the unit into an electrical outlet and allow it to preheat for five minutes. 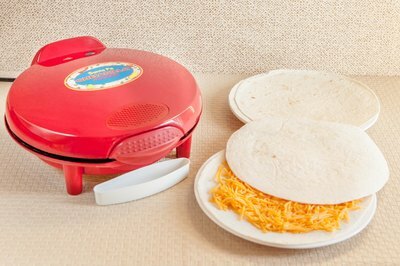 Prepare your quesadilla with your favorite type of cheese and any additional toppings while the unit preheats. When the unit is ready for cooking, the green "Ready" light at the rear of the lid will turn off. 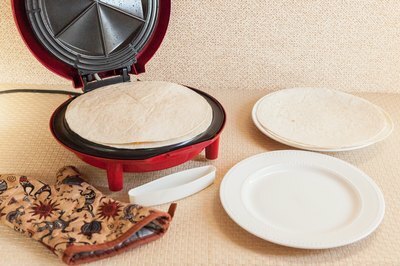 Open the lid of the unit with an oven mitt or a pot holder and place your quesadilla on the cooking plate. Place the drip tray beneath the front of the unit to capture any grease. Close the lid with an oven mitt or pot holder. Though there is a latch at the front of the unit, it need not be closed for proper cooking. Allow the quesadilla to grill for three to five minutes. For softer quesadillas, aim for a shorter grill time. For crispier quesadillas, opt for a longer grill time. 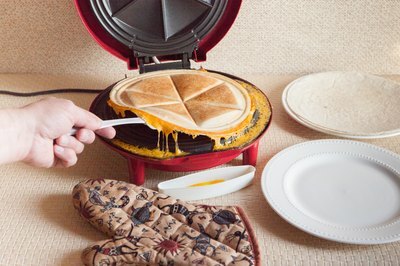 Raise the lid with an oven mitt or pot holder and remove the finished quesadilla with a plastic spatula. Close the lid to preserve heat for the next quesadilla. Repeat Steps Four through Six for each quesadilla you wish to prepare. Turn off the unit when finished and allow it to cool completely before cleaning with a damp cloth and a small amount of mild dish soap. Rinse out the drip tray once any collected grease has cooled. 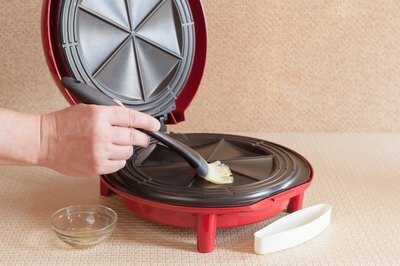 Experiment with different quesadilla recipes to get the most out of your Santa Fe Quesadilla Maker. Never submerge the unit in water or run it through a dishwashing cycle. 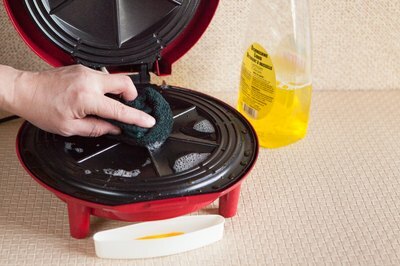 Use only damp soft cloths and a small amount of mild dish soap to clean the cooking plates. Never leave the unit unattended while it is grilling. This is an electrical and fire hazard. Avoid using metal cooking utensils because these may damage the surface of the cooking plates.